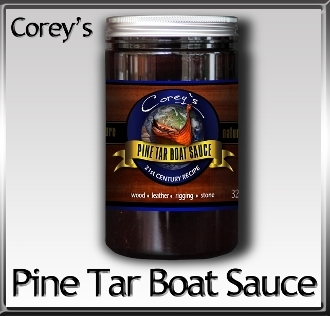 We are so proud to offe you Corey's Pine Tar Boat Sauce. Linseed Oil and Pine Tar recipe has been used in Scandinavia on wooden boats for over a 1000 years. Now with bio derived solvents and pine tar made from recovered materials, we can offer a higher performing, safer boat oil. We also replaced Linseed seed with superior Pure Tung Oil. All in all, we took an old recipe and made it much better. Made with organic bees wax.